Joe Pino, trumpeter, composer, and educator, has always pushed for musical excellence. 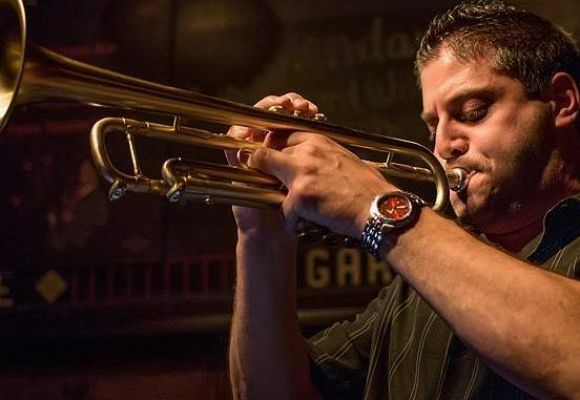 In May 2008, Joe earned his Bachelor of Music degree in Trumpet Performance from the world-renowned music school, Berklee College of Music in Boston, MA. Years later, his talent has taking him far. His extensive performance career leads him into performing at some of the best concert halls and clubs around New York City, Philadelphia, Boston, and Washington D.C. The hard working Boston native stays busy with gigs and sessions around NYC, particularly in the Jazz scene. Joe’s reputation as a jazz trumpet player has also led him playing with well-known artists such as The Temptations, Morgan Heritage, The Happenings, and legend TV star, Vicky Lewis. Joe leads his quartet, organ trio, and freelances, which has gave him an extensive performing schedule playing at some of the greatest venues all over the country; Blue Note Jazz Club NYC, Summer Stage Central Park, Club Bonafide, The Mann Center, Smalls Jazz Club, The Garage, Why Not Jazz Room, Chris’s Jazz Café, Shrine, Silvana, Tea Lounge, Shape Shifter Lab, Piano’s Lounge, Treme Jazz and Blues Club, The Sugar Bar, Trumpets Jazz Club, Twins Jazz Club, Somethin’ Jazz Club, The Fat Cat, House of Blues Foundation Room, Chianti Jazz Lounge, Ryles Jazz Club, The Zeiterion Theatre, and The Wilbur Theatre. Joe has also transcribed many jazz artists solos, one which is featured in a Bugles Media Publications Book called The Improvisation Style of Jim Rotondi By: Eric Siereveld. Joe was playing 2nd trumpet in The National Broadway Tour of Woody Allen’s “Bullets Over Broadway”. The show ran from October 2015 to July 2016 with performances throughout the country. Performed and Studied with These Artists: Jim Rotondi, Brian Lynch, George Garzone, Matt Wilson, Livingston Taylor, Jeremy Pelt, Mark Walker, The John Hoppin’ Jazz Orchestra, The Hot Shim Sham Orchestra, The Harlem Renaissance Orchestra, The Brooklyn Big Band, Oscar Stagnaro, Lin Biviano, Charlie Lewis, Jeff Galindo, Jeff Stout, Victor Mendoza, The Boston Horns, James Montgomery, Big Sam from Big Sam’s Funky Nation. Teaching: Joe has been on faculty teaching students all ages, private and group lessons for Berklee College of Music’s City Music Outreach Program, Music and Arts, Harborlight Montessori School, The Beverly Public School System, and online Skype lessons. Endorsements/Family of: Stomvi USA, Adams Musical Instruments, Torpedo Bags, and Wallace Brass Mutes.